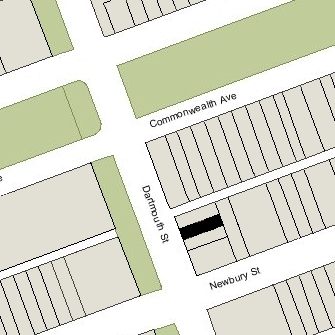 281 Dartmouth is located on the east side of Dartmouth, between Commonwealth and Newbury, with 283 Dartmouth to the north and 279 Dartmouth to the south. 281 Dartmouth was built ca. 1871 by building contractor James M. Standish, one of three contiguous houses (279-281-283 Dartmouth). He and his wife, Sarah (Grant) Standish, lived at 283 Dartmouth and sold the other two houses. Click here for an index to the deeds for 281 Dartmouth. 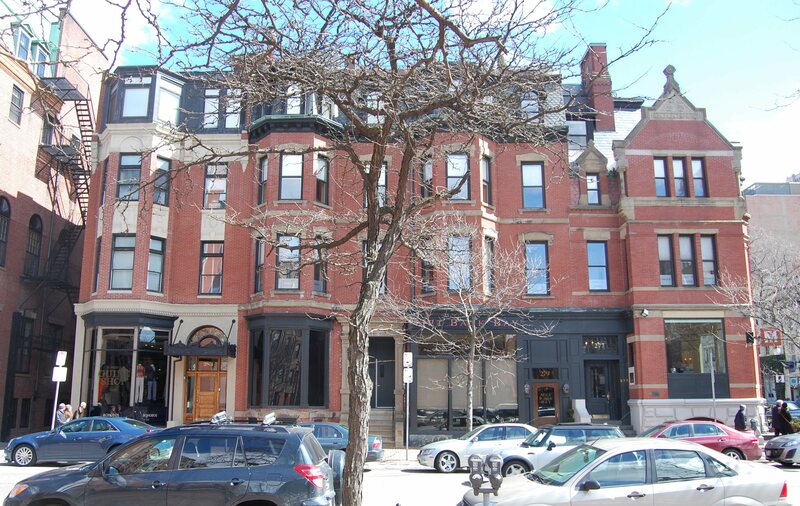 On May 1, 1872, 281 Dartmouth was purchased from James Standish by Elizabeth Bishop (Beals) Kendall, the widow of merchant Isaac Kendall and daughter of William Beals, co-founder of the Boston Post. She lived at 123 Commonwealth. On July 16, 1872, Elizabeth Kendall transferred 281 Dartmouth to her widowed mother, Dorothy (Dolly) (Whitney) Beals, who made it her home. She previously had lived at 45 Hancock. In the deed, Elizabeth Kendall specified that the property was being transferred to Dolly Beals for her use during her life, and that on her death, it was to become the property of Dolly Beals’s ten children. Dolly Beals died in January of 1876. 281 Dartmouth was shown as vacant in the 1878 Blue Book. On October 24, 1877, 281 Dartmouth was purchased from the Beals family by Benjamin Sewall, a cordage manufacturer and shipping merchant. He was a widower, and living with him were his grand-daughter and her husband: Louisa Sewall (Hubbard) Jackson and John Cotton Jackson. John Jackson was an officer and General Agent of the American Linen Thread Company. Both Benjamin Sewell and the Jacksons made their primary home in Weston. Benjamin Sewall died in October of 1879 and the Jacksons moved soon thereafter, traveling to Europe where John Jackson studied metallurgical engineering. On April 26, 1880, 281 Dartmouth was acquired from Benjamin Sewall’s estate by Dexter Townsend Mills. He and his wife, Lavinia Frances (Barnet) Mills, made it their home. They previously had lived at 50 Worcester. Dexter Mills was an importer, distiller, and dealer in commercial alcohol and liquor. He died in March of 1896 and Lavinia Mills moved soon thereafter. In his will, he specified that his property be held in trust for his wife and three daughters until their deaths, and sold thereafter for the benefit of various charities, notably the Museum of Fine Arts. By the 1897-1898 winter season, 281 Dartmouth was the home of Mrs. Mary (May) Adeline (Bradbury) Estes, the former wife of Prince Joseph Estes, who rented the house from the Mills estate. She operated it as a lodging house and provided offices for doctors. By the 1899-1900 winter season, she also had rented 279 Dartmouth from Mary Amanda (Greene) Smith, the widow of Dr. J. Heber Smith. The Smiths had lived there until his death in October of 1898. From 1900, Mrs. Estes listed both 279 and 281 Dartmouth as her residence in the Blue Books, and expanded her lodging house to include both buildings. Among Mrs. Estes’s lodgers at 281 Dartmouth were William G. Ward and his wife, May (Alden) Ward, who lived there from about 1900 through 1905. He was a professor at Emerson College of Oratory, and she was an author, primarily of biographies, and a lecturer. Their daughter, Helen Ward, a teacher, lived with them. In 1898, they had lived in Syracuse, New York, where he was a professor of English literature at Syracuse University. By 1906, they had moved to Brookline. 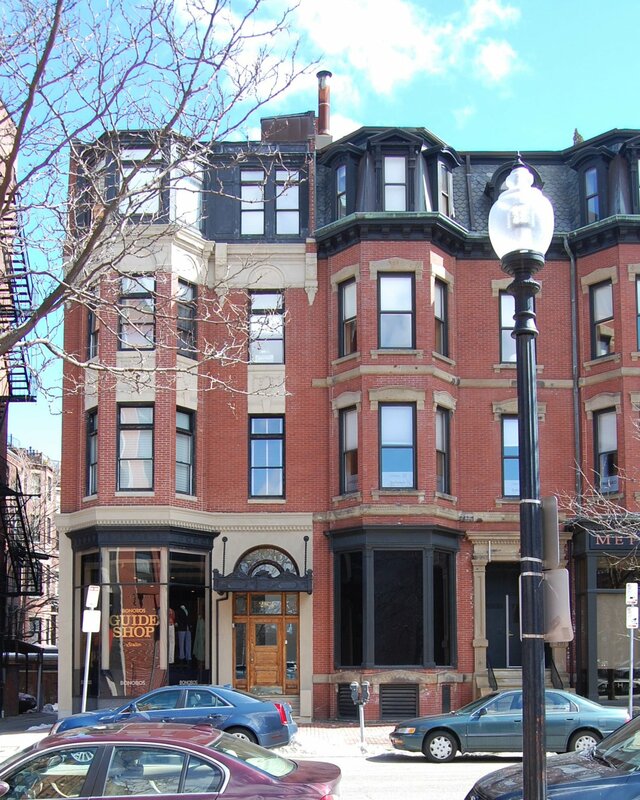 By the 1906-1907 winter season, Mary Estes rented 277 Dartmouth from the estate of Harriet (Upham) Putnam and extended her lodging house into the third building. In April of 1910, Mary (Ruby) Morrison, the wife of architect William Langley Morrison, purchased 277 Dartmouth. It became the home of her mother, Anne Ruby (the widow of James Ruby), and also the location of Mrs. Morrison’s import and dressmaking shop, Mary Ruby, Inc. In February of 1912, Mary Morrison purchased 279 Dartmouth, and she and her husband made it their home. Mary Estes continued to live and operate a lodging house at 281 Dartmouth. 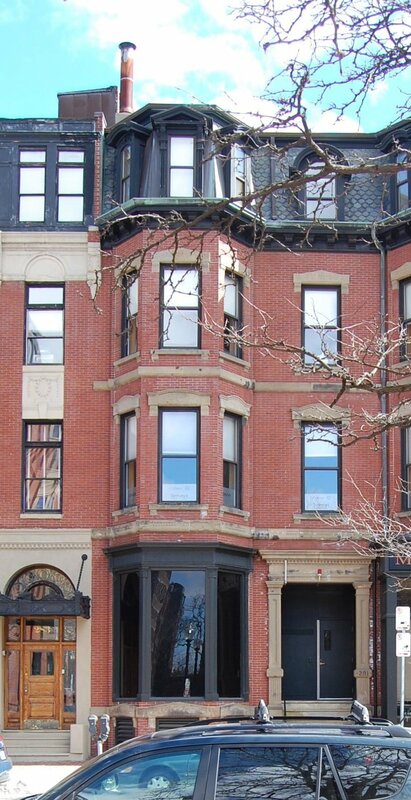 By 1917, the Boston Society for Decorative Arts had leased a storefront at 279 Newbury and additional rooms at 281 Dartmouth. In March of 1917, it applied for (and subsequently received) permission to cut a door between 279 and 281 Dartmouth. The Society continued to be located at 279 Dartmouth in 1920, but was no longer there by 1922. Mary Estes continued to live (and operate a lodging house) at 281 Dartmouth until 1923, when she purchased and moved to 25 Marlborough. In about 1922, 281 Dartmouth became the location of Helen Crosby, Inc., a womens’ clothing store, operated by Mrs. Helen F. (Crosby) Dervin. She previously had operated a millinery shop at 149 Newbury. There continued to be two apartments on the upper floors. Helen Crosby Dervin and her husband, Dr. Peter John Dervin, a physician, lived at 157 Harvard in Dorchester. In July of 1928, the trustees under Dexter Mills’s will applied for (and subsequently received) permission to remodel portions of the building, including removing a bay window at the rear. The property remained a store with one apartment above. Peter Dervin died in June of 1933. By 1934, Helen (Crosby) Dervin had moved to an apartment at 281 Dartmouth. 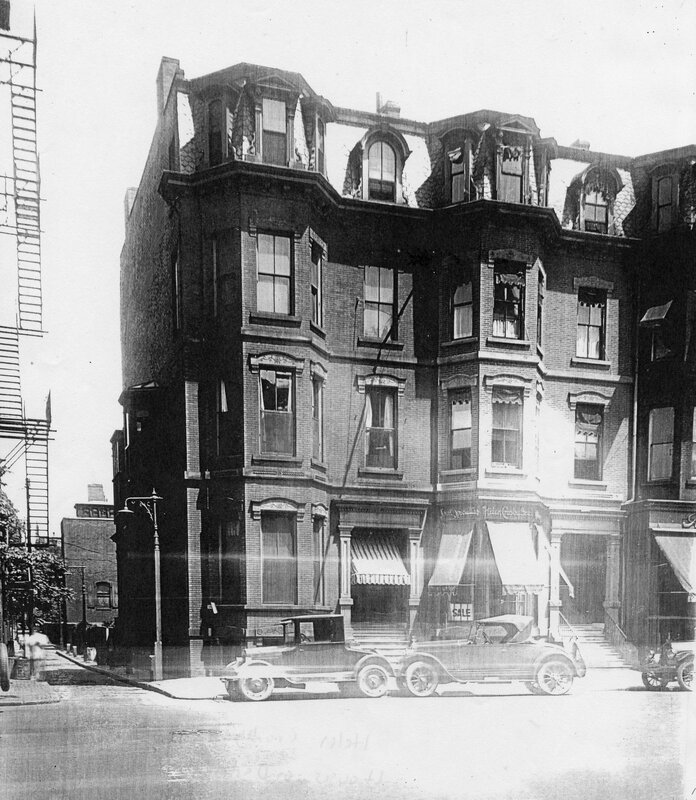 She continued to live there and operate her dress shop until her death in July of 1938. Helen Crosby, Inc., was acquired by Lola (Baker) Butts, the wife of Clarence A. Butts (Butz), a writer. They moved to 281 Dartmouth by 1939; they previously had lived at 8 Garrison. Clarence Butts died in May of 1945. Lola Butts continued to live at 281 Dartmouth and operate the Helen Crosby Shop there. By 1945, 281 Beacon had been transferred by Dexter Mills’s estate to the Museum of Fine Arts, and on May 13, 1946, it was purchased from the Museum by Lola Baker Butts. The Helen Crosby Shop remained on the main floor of 281 Dartmouth until about 1956, when Lola Baker Butts applied for (and subsequently received) permission to convert the commercial space into a restaurant, with three apartments on the upper floors. Joseph’s Restaurant, which had been located at 277-279 Dartmouth since the late 1940s, expanded into the new restaurant space. It remained until about 1979, when it was replaced by Joe’s American Bar and Grill. Lola Butts died in July of 1964. In her will, she left 281 Dartmouth to her brother, Leonard Perry Baker of Dayton, Ohio, and her “good friend and spiritual advisor” Rt. Rev. Joseph Patrick Donelan. Monsignor Donelan was director of the Archdiocesan Councils of Catholic Men and Women; he lived at 333 Commonwealth, which at that time was St. Patrick’s Manor, a home for elderly women operated by the Carmelite Sisters for the Aged and Infirm. 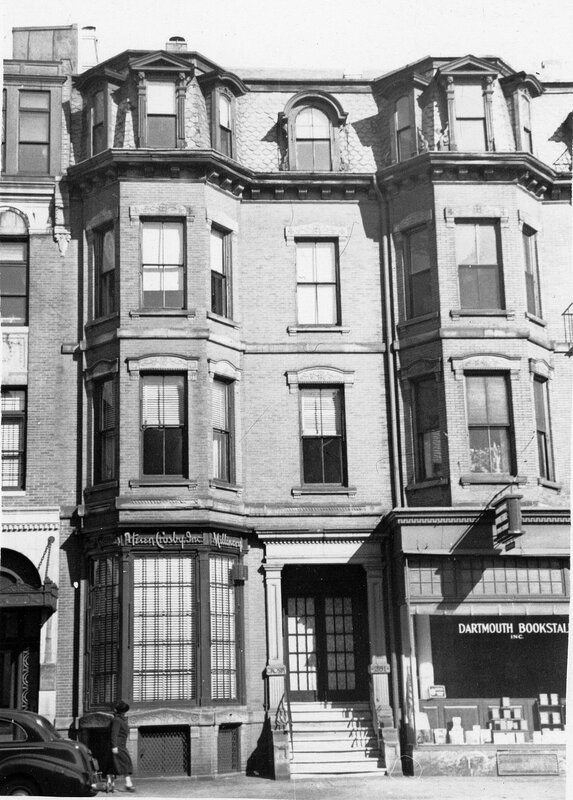 On October 19, 1964, 281 Dartmouth was acquired from Leonard Baker and Joseph Patrick Donelan by Uptown Realty, Inc., which already owned 277-279 Dartmouth.